The primary reason I kicked off this blog was to help teach cooking-phobes and rookies how to cook. When I hear about success stories I love it. “I tried your ___ recipe and it turned out great!” is music to my ears. Recently, I successfully managed to teach this recipe to a cooking novice and am proud that they embraced the recipe and have even made it their own. Now I wouldn’t be me if I didn’t point out that asparagus is very much fresh and in season right now. I am a firm believer in cooking foods that are in their peak and this is a great recipe to highlight the deliciousness that is fresh asparagus. Just make sure when purchasing that all of the asparagus in the bunch are about the same size – so either all skinny or all thick. For this recipe I prefer thinner asparagus. This recipe is completed with the Tangy Walnut Vinaigrette posted on this site. I’ll repeat the recipe and ingredients so you don’t have to bounce between recipes or print out extra pages. Just know if you like the dressing the recipe is available on its own. Wash the asparagus and trim off the tough ends, usually about 1-2 inches up the bottom of the stalk. Discard these. Cut the asparagus into 1 inch pieces. Set aside. Chop the walnuts roughly into pieces and set aside. Cook the rice according to the directions. To add extra flavor use chicken or vegetable stock instead of water. While the rice cooks remove the skin from the garlic and chop into a fine mince, or use a garlic press to smash the garlic. Add the garlic to a bowl, measuring cup, or jar (really whatever container of your choice). Add to the container the lemon juice, vinegar, salt, and mustard and whisk until combined. If you don’t want to use a whisk you can use a fork for whisking. Add the oils to the container and whisk until everything is combined. Set aside. Steam the asparagus over 1-2 inches of boiling water in a steamer basket in a covered saucepan for about 4 minutes or until tender. If you do not have a steamer, boil the asparagus for a few minutes in water until slightly tender – just be careful not to overcook and strain the asparagus from the water immediately after boiling. 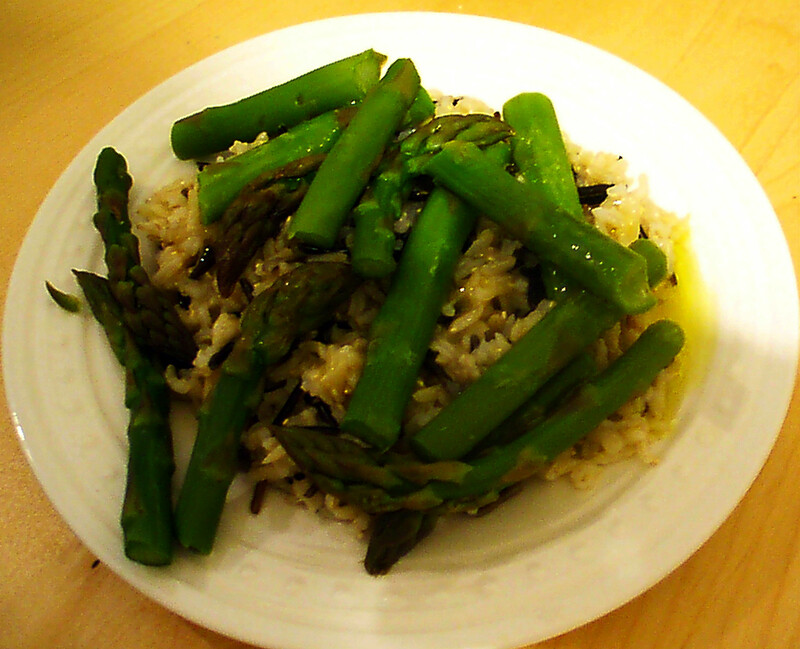 When the rice has finished cooking combine it in a bowl with the asparagus, walnuts, and the dressing. Stir so that everything is coated in dressing. Sprinkle in salt and pepper to taste if preferred and stir well. I really love this vinaigrette. It can be used on hot or cold salads, goes with most vegetables, and can be thrown together quickly. Plus now that spring is here the farmer’s markets are coming alive again with delicious fresh produce that could use some dressing. I originally discovered this recipe as a part of a bigger recipe in The New York Times. I will post the larger recipe shortly as it’s really quite delicious and contains ingredients that are in season at the moment. When it comes to substitutions, you can make them. For instance, if you don’t have walnut oil you can just sub with more olive oil. It means it won’t be a walnut vinaigrette, however it will still be delicious. Also you can add more or less garlic depending on your preferences – and if you don’t have fresh garlic you can always use garlic powder to taste. I’ve made my own subtle changes to the original recipe, so you should too if you need to. Remove the skin from the garlic and chop into a fine mince, or use a garlic press to smash the garlic. Add the oils to the container and whisk until everything is combined. Serve over salad and enjoy! The dressing should keep in the fridge for a few days. Every spring my good friend Sass (@grazingingrass – follow her!) puts on a fabulous picnic to celebrate Hanami. Hanami is the traditional viewing of the Japanese Cherry Trees, and my friends celebrate here in DC during the Cherry Blossom Festival with a picnic of Japanese foods (both authentic and inspired) or whatever people bring to share. This picnic is an annual highlight and a great chance to break out of the mold and try cooking new things. I definitely think these meatballs are the most successful item I’ve cooked for Hanami to date – ironic of course that I couldn’t eat them. I did make major adjustments to the original recipe, which I found in the March 2012 issue of Food & Wine magazine. I’m going to post below what I did as I know it was a success. The biggest adjustment I did have to make to the original recipe was to the meat. When I went grocery shopping there was no ground chicken, so I had to substitute with ground turkey breast. I also baked and pan seared the balls as opposed to grilling them per the original recipe. I had to work with the tools I have, and so that’s reflected in the delicious recipe below. In a medium bowl (the bowl you’ll eventually mix the meatballs in) zest the whole lemon. Save the remaining lemon for serving. Remove the skin from the shallot and chop into a fine mince. Add to the bowl with the zest. Cover a baking sheet with tin foil. This will ease clean up later – you’re welcome. In a small saucepan combine the sugar, sake, soy sauce, and ¼ cup of the mirin. Bring the sauce to a boil over high heat and cook for 3-5 minutes until the sauce reduces to about ¾ cup. Make sure to stir well so the sugar doesn’t burn to the bottom and dissolves into the sauce. Set the sauce aside to allow to cool. In the bowl with the zest and shallot, add the turkey, salt, and 2 tablespoons of mirin. Mix the meat with the other ingredients until well combined. I find that using your hands works best, however you can also use a spoon. Form the meatballs, making them about 1 inch in diameter, and place on the baking sheet. 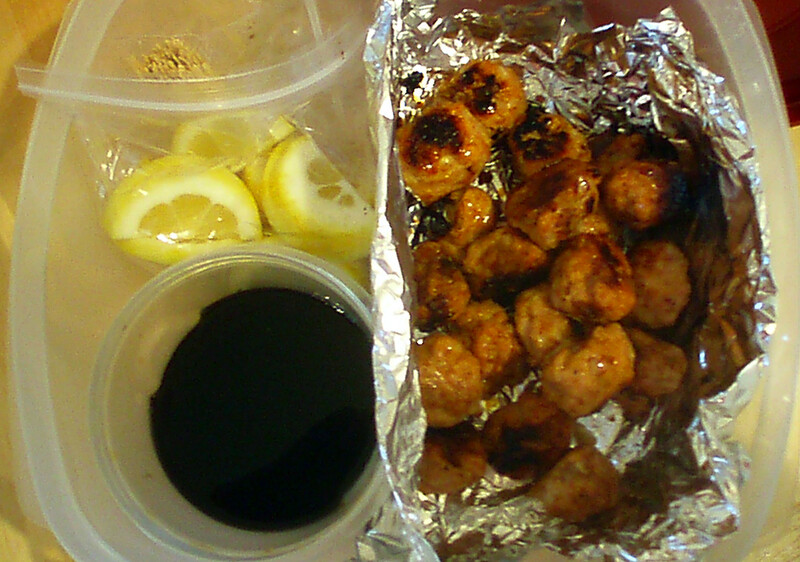 After the 15 minutes carefully baste (or drizzle with a spoon) the meatballs with a little bit of the sauce. Bake the meatballs for another 5 minutes. Heat a skillet over medium and add 1 tablespoon of canola or vegetable oil. Once the oil is hot toss the meatballs into the skillet to brown them for about 3 minutes. There is no exact timing here, just brown until they look good to you. Once browned pour about ¼ cup of the sauce to the pan making sure to coat the meatballs, and cook for an additional 2 minutes. Serve the meatballs with the leftover sauce as well as wedges cut from the lemon and enjoy!